This powerbank combines design and performance. In an opulent black housing is pure performance. You get a power bank for leisure, travel and work. Charge and operate your devices directly via the 220-240V output, without searching for the right adapter. Up to three USB devices can be additionally charged in parallel. 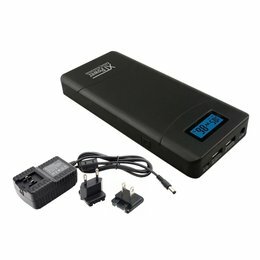 The Powerbank XT-160Wh has high-quality, automatic charging and discharging electronics, supplemented with overload, short-circuit, over-discharge and over-temperature protections to protect your investment. The remaining capacity of the installed battery is indicated by four blue LEDs. The high-quality lithium-ion cells ensure a longer life. 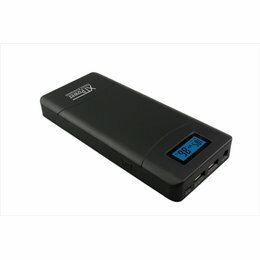 The XT-160Wh is also safer, greener and more portable than standard heavy lead batteries. With a weight of only 1.8kg and the compact dimensions of 23.3x9x9cm, the XT-160Wh can become your mobile solution. Output USB QC3.0: 5V / 3A 9V / 2A 12V / 1.5A. The selection via connected device is determined. Suitable for various types of devices such as laptop, smartphone, mobile phone, radio, drones, LED lights and fairy lights, iPhone, iPod, iPad, MP-3 player, navigation, camera, etc. With a weight of only 1.6kg and the compact dimensions of 23.3x9x9cm this powerbank is one of the smallest solutions with a 220-240V output at a capacity of 160Wh. This powerbank will very quickly become an ideal companion for your leisure time activities as well as for professional use. 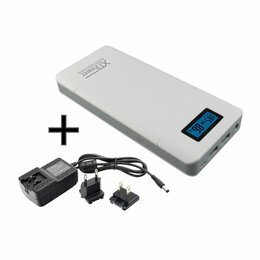 The Power Bank XT-160Wh comes with the Performance Energy Storage, a power supply, a protection box for the power bank and power supply, and manual. Charging Solar Panel regulated solar panel with output voltage 17-28V / idle voltage max. 30V. 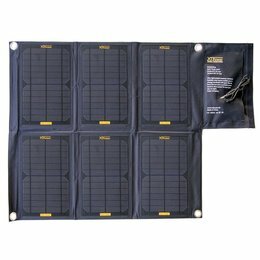 Charging function with up to 30 Watt also with stronger solar panels. Function Connection for laptop, camera, drone and many other devices up to the maximum allowable power. Actual voltage selected by charging device based on QC2 and QC3 standards. All outputs are deactivated when not in use. Continuous operation without load is not possible. The AC 220-240V output is activated and deactivated by double-clicking the power button. When charging and operation of your equipment with the mobile power supply, please observe the LCD capacity indicator. If you connect equipment with a high power consumption, the available capacity may drop quickly and the capacity of 154Wh cannot be fully provided. For devices with low power consumption (for example LEDs, small laptops), the battery is discharged at low level and is therefore able to provide more energy. You will then receive a significantly longer operating time. Do not always use the mobile power station continuously at maximum output. The LED light knows three modes: continuous light, SOS and flashlight. Press and hold the power button for 3 seconds to turn on the LED light. Pressing again for three seconds will switch from one mode to the next. Press again for three seconds to switch off the LED light.